Entrepreneur builds a sleek ship, but will anyone buy it? 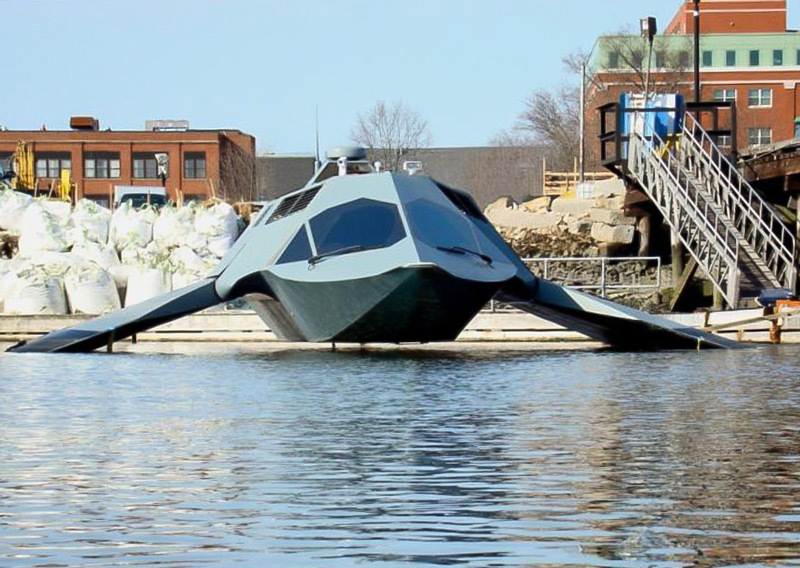 KITTERY, Maine (AP) — Even on land, the Ghost looks futuristic and fast. The angular vessel looks like a waterborne stealth fighter. It rides atop underwater torpedo-shaped tubes powered by a pair of 2,000-horsepower gas turbine engines. Gyroscopes keep the ride smooth. Sadly, the Ghost is all revved up with no place to go. The brainchild of a wealthy inventor and entrepreneur, the Ghost might never be a familiar household name like Humvee or Apache — even if it works as advertised — because its creator built a warship the Navy isn’t convinced it needs. He might be right: The Ghost rides on struts connected to engine assemblies he says take advantage of supercavitation, traveling underwater inside a bubble of gas. It’s a new application of technology that Sancoff insists will make the Ghost fast — it’s so far hit about 35 mph (56 kph), but Sancoff believes it can approach 60 mph (96.6 kph) — while staying stable even in rough seas. Sancoff has taken the usual step of sinking $15 million into a prototype that he hopes to sell to the Navy, turning upside- down a process in which normally the military identifies a need before soliciting proposals and seeking funding. The Ghost’s smooth ride makes it an ideal platform for weapon systems — and for transporting Navy SEALs, Sancoff said. Supercavitation has been used to produce high-speed torpedoes, but Sancoff said he’s adapted it for the first time to propel a surface warship. Under his design, dual propellers were moved to the front instead of the rear and underwater ailerons control the vessel, which banks like an airplane when it’s turning. He was so convinced that he created a company and built it. That sort of entrepreneurial spirit used to drive military innovation but it’s no longer the norm in an era of high-tech, costly programs. These days, the Pentagon decides on its military requirements and then solicits proposals. The Navy currently does not have a requirement for such a patrol boat, said Chris Johnson, spokesman for the Naval Sea Systems Command. But Sancoff’s design is at least worth a look, even if it turns out to be unfit for military use, said retired Vice Adm. Pete Daly, CEO of the U.S. Naval Institute, an independent, nonpartisan organization in Annapolis, Maryland.